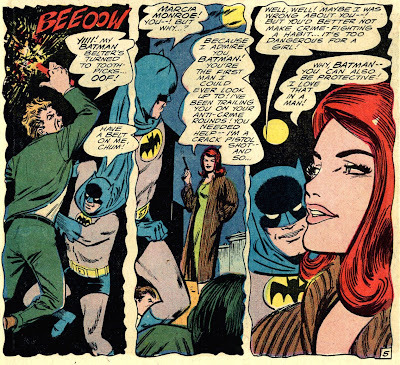 The Brave & Bold team-up stories of the 1960s pose a problem for Batman fans. 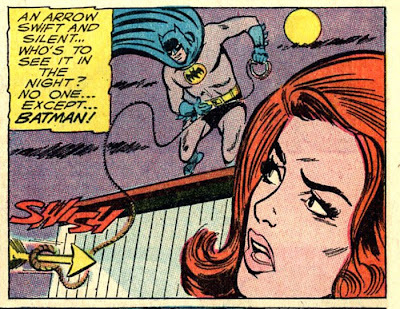 They're bad, but that's not really the crux; there were many bad stories during the Batman Silver Age. 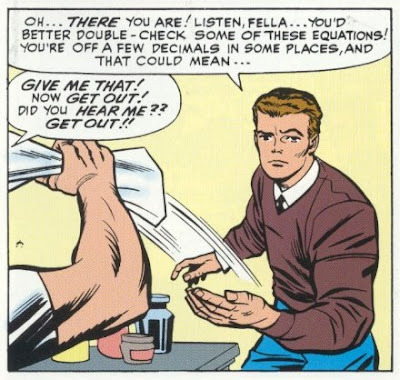 The problem is that they were created by writers who weren't familiar with the characters enough, and edited by George Kashdan, who apparently didn't worry too much about little things like continuity or characterization. The result can be ignored for some of the heroes involved; not many Supergirl or Wonder Woman fans obsess over the ridiculously girlish way they acted in B&B #63. But Batman has a tougher time, because there are so many Batman teamups from 1966 on that it constitutes a significant body of work. 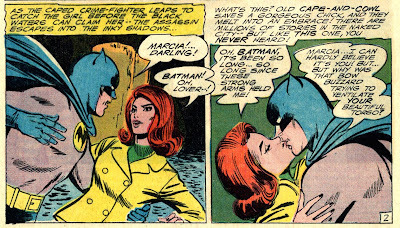 There are some stories that must be either ignored or palmed off as involving Batman from Earth II. How else can you explain Bruce Wayne appearing as an adult in WWII London? Answer: You can't. It was ludicrous in the 1960s; now of course it would make him an 80-year-old codger. Let's look at Brave & Bold #64 for an example of the horrific characterization that typified these stories. "But why was that bow buzzard trying to ventilate your beautiful torso?" Timeless dialogue! Why, yes, I'd be happy to have a crack shot on my team, never mind that my parents were gunned down by a crook. And before you know it, when they're not busting up crime gangs, they're steaming up the windows of the Batmobile. But then she dumps him, which brings us up to the point where they rediscover each other. 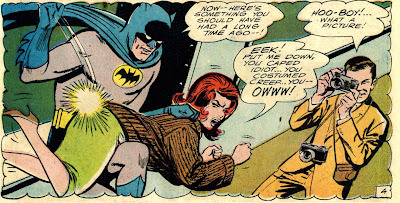 Now, that's pretty horrific characterization for Batman. Dumped by a society chick? We learn that she went on to become engaged to another man, named Nicky. Nicky was determined not to live off her inheritance, so he... became a thief. Say what? He's too noble by half! 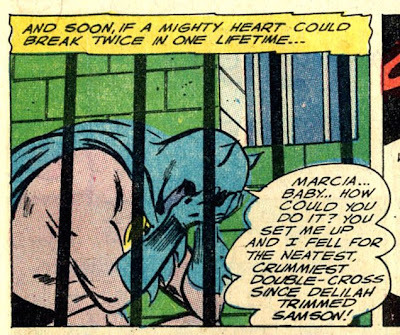 With Batman in jail, we learn (sort of) the real plot. Marcia is actually a crook working for a syndicate known as Cyclops. She has managed to free Eclipso from the body he shares with Dr Bruce Gordon (hmmmm, Bruce Gordon?) so that he can join her on a criminal rampage throughout Gotham City. But it turns out that Marcia has been forced to work for Cyclops because they threatened to kill her dad. So it's okay that she dumped our hero, because she did it for family. Sheesh! 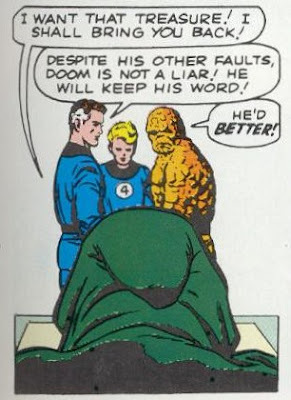 What do you see when the Fantastic Four's worst enemy bends over? Dr Doom was far from an original character. 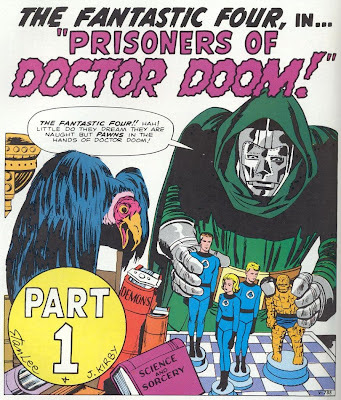 The name, Dr Doom, had commonly been used in comic books for villains. The concept of a man hiding his tragically disfigured face behind a mask goes back at least to the Phantom of the Opera. 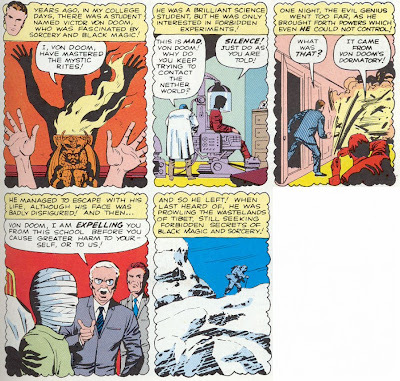 Lee and Kirby often ended stories with Dr Doom apparently dead; this was something of a nod to the Golden Age Batman tales with the Joker always dying at the end and yet returning again. We also learn that Doom is the ruler of a distant European land called Latveria in that story; this will become a longtime plotpoint in the Marvel Universe.